Connect with our eye-opening blog. We appreciate staying connected to our customers and business partners. From new product introductions to leading industry advice to help improve your operation, we’ll share the latest right here. Patz has been named #30 on Feedspot.com’s Top Agriculture Blog List! As winter weather approaches, many producers are turning to hay for their winter feedings. 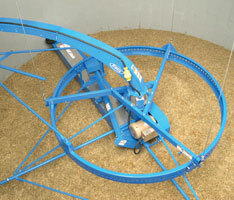 Hay can be one of the most difficult forages to preserve – in fact, more than 50% of harvested hay is wasted. While it may not be possible to prevent all hay loss, the following feeding and storage tips can help you get the most out of your hay this winter. Storing hay outdoors can result in losses of up to 20% of your bale. 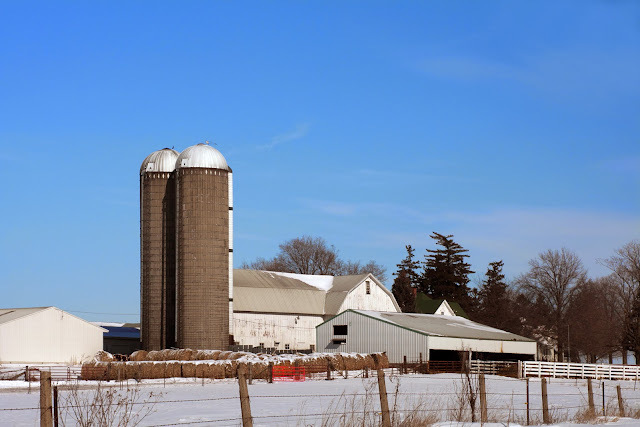 If indoor storage is not an option, steps can be taken to reduce dry matter losses: select an elevated area that is not located under trees to store bales – this will allow water to drain and bales to dry faster following any rain or snow. Bales should be arranged in a single layer, covered with tarps, and elevated off the ground with pallets or gravel to prevent quality loss due to moisture wicking or mud. Storage losses of up to 40% are typical for uncovered round bales. Bales that are exposed to inclement weather will decrease in digestibility. Ensure your bales are tightly packed to reduce moisture penetration. Hernandez states that, when using your palm, if you can compress a newly packed bale more than a half-inch, you should expect significant losses. Since hay that is stored outdoors will spoil and lose palatability more quickly, farmers should feed this hay first. Cows can waste up to 50% of the hay they are fed. 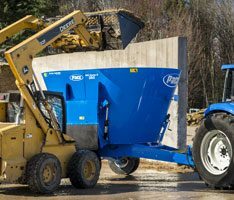 Using a Patz Vertical Mixer to incorporate hay into your total mixed ration is a good way to help reduce hay waste during feeding! 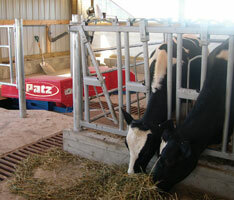 Patz mixers produce a consistent, thoroughly-mixed TMR, which prevents cattle from sorting. There’s only 3 weeks left until Christmas! Get your shopping done early by taking advantage of our Stearns Bank financing offer for December – put zero down and make no payments until 2014! 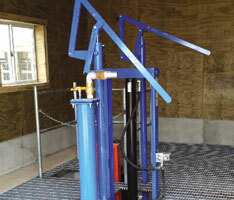 U.S. customers who purchase new Patz equipment will be able to postpone their payments until 2014. This allows the customer to take advantage of Section 179 tax deduction for 2013, without having to pay any money out of pocket until 2014! Let your equipment start generating revenue before your payments begin! For more information, contact Stearns Bank at 1-800-247-1922. Don’t delay – this financing offer ends on December 31, 2013! Patz is pleased to announce the availability of a Tub Mounted Magnet* that will fit our most compact mixers! The addition of this Patent Pending Tub Mounted Magnet to our 400 Series and 270 cubic foot capacity 800 Series Vertical Mixers means that a Patz Vertical Mixer of any size can now be fitted with a Tub Mounted Magnet* to help you protect what matters! Our new Patent Pending Tub Mounted Magnets fit easily into the tub wall of Patz Vertical Mixers. Encased in stainless steel, the magnet is mounted on a hinged assembly for easy removal of tramp metal. Our Patent Pending Tub Mounted Magnet is now available for ALL Patz Vertical Mixers! 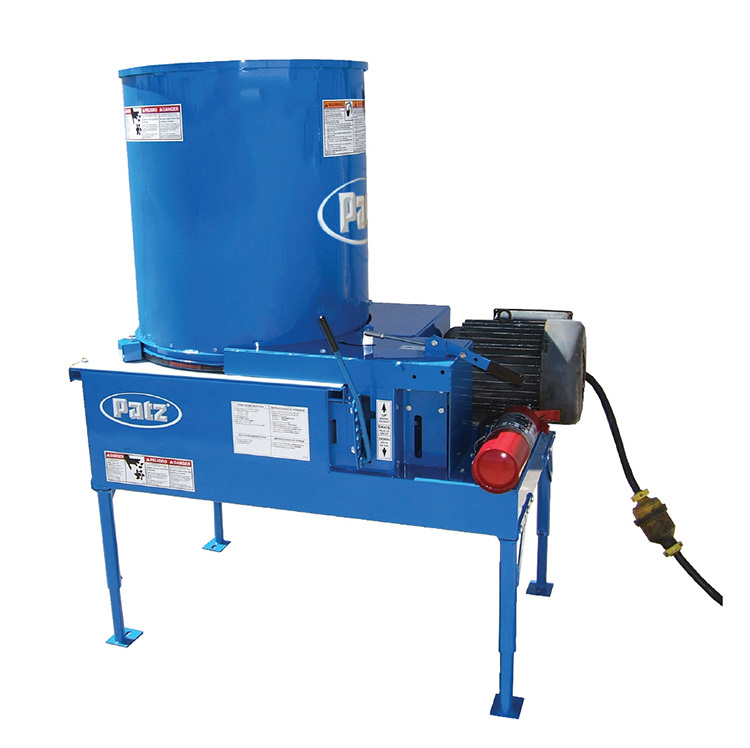 New mixers can be ordered with a factory-installed Tub Mounted Magnet*, or contact your local Patz Mixer Dealer to field-install the magnet on your existing stationary, trailer, or truck mount Patz Vertical Mixer. Note: This Patent Pending tub mounted magnet must only be installed on Patz Vertical Mixers.